There are four key factors you should fully understand if you are going to sell your home for its full value. We like to think everyone who sells a house wants to realize as much money as possible in the sale. But a list price that is too high often nets the seller less than market value! 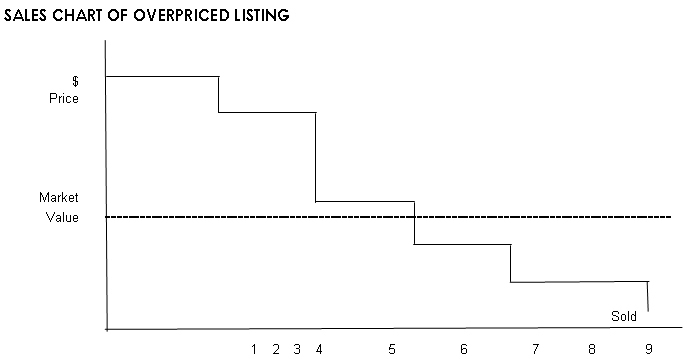 Overpricing, particularly in a buyer's market, can be disastrous. 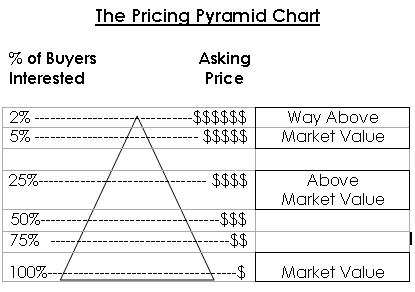 The market value of a house is the price that a willing and knowledgeable buyer and seller will agree upon. Only the market value is of importance to the buyer! Pricing your home accurately and within 2 - 4% of the market value is essential. Serious buyers with money and motivation quickly learn the market value of other homes that meet their (similar) needs or your competition. They usually are not willing to waste time bidding and sometimes looking at overpriced properties. 1. Recently sold prices of other comparable homes in your neighbourhood, or comparable neighbourhoods. 2. Market trends; are they increasing or decreasing? 3. The condition and show ability of your home at the time of viewing. 4. What you are prepared to negotiate in the agreement of purchase and sale. c. Better response to advertising, signage, ads etc. So with this in mind, let's see how your initial list price can directly affect the final market value of your home, which is the final price you will realize in its sale. ● You will help sell other homes as they will appear to be better value. The charts above shows the relationship of activity on a competitively priced home, (the interest among buyers) versus a home priced too high over the first few weeks of a property going on the market for sale. Statistics show that a property attracts the most excitement and interest among agents and buyers when it is first listed. Interest peaks usually around the third week, dropping off sharply after weeks 4 and 5, as purchasers either move to make other purchases or turn to newer inventory. After the activity has declined to a trickle, or less, the seller has no choice but to adjust the price which rekindles interest among agents and buyers alike, depending directly on the amount of the reduction. If the price slowly inches down, the activity will die down as time goes on. However, a reduction which reflects the real market value can usually generate the needed activity to get the property sold, and still at a fair price. The following chart illustrates how failure to bring the price into line with fair market value within a reasonable period of time can lead to a selling price below market value! When a property is priced too high and does not sell in the beginning, the seller reduces the price in an effort to promote a faster sale. As more time goes by, the seller continues to reduce the price. However, because less interest is generated the longer a property remains on the market, the price drops until the house finally sells at a price below market value. Stats and Surveys, they are all a little different and yet there appears to be a lot of commonality with them. This is tabulated from our own research. The market is changing in that people are using the web and email more and more everyday as a constant communication vehicle. Agent show properties that are good buys. 1. Look closely at the market values; sales of comparable properties in your area and/or competing areas. 3. Discuss suggestions of the market value and show ability of your home with your REALTOR®. Is there anything you are willing to do to improve the market value of your property. Ask yourself what you would pay for the house if you were the buyer. Research indicates that by setting your price within 2 - 3% of the market value achieves some of the best results. The first five minutes are critical in selling your home! It has been said that buyers make up their minds in 5 minutes, and then spend the rest of the time rationalizing their decision. The closer you can bring your home to impeccable move-in condition, the easier it will be to get the best price. Home buyers inspect many houses, all within the same price range. They begin making value judgments from the moment they drive up to a house. Their first impressions begin with the yard, the driveway, and the front door. Once inside, buyers can feel the pride of ownership of an attractive, well maintained home, or its absence. Are the two homes equally mechanically sound, and both priced the same, yet one is impeccably clean, the other has nicks and scratches, dirt on the doors, and a couple of missing floor tiles. If you are a buying a car, and see two cars of equal performance, but one has a shinier finish and floor mats, which one do you choose? How much does the dirtier one have to be reduced in price before you will consider buying it? Quite a lot. A car is for a few years. How much more, then, a house? So showcase your house. Here are 10 steps to make your house ready for viewing. Attending to them can make a difference of literally thousands of dollars in the market value of the property. 1. Start with the outside. Look at your front yard through the eyes of the buyer who is starting to make judgments from the moment they step out of their car. Is the front yard clear of toys, tools, and building supplies? Are the lawn and the shrubberies properly cut and attended to? Are the flowers blooming? Are there oil stains in the driveway? Is the barbecue dull and rusty, or bright and black? 2. The exterior of the house. Is the paint fading or chipping? Is there any mildew or mold? If the paint needs a new coat, the most important places to freshen up are the trim and the front door. If the paint is new, then have the exterior of the house, and the decks, pressure washed. 3. Inside the house. Go through your house room by room and pack up 30% of the accessories. The family who wins the Housekeeping Award probably sells their house first. The cardinal rule is this: the way you live in a home and the way you sell a home are two different things. Remember you are in competition with all the other properties your prospective buyers are looking at. Look at it this way . . . you are going to move anyway, so just consider this advance packing! Remove as many items from your storage areas as you can, and hang clothes neatly and tidily. Remove any furniture that might be a bit too much for the room. 4. Take a look at the paint. If painting is required, use flat latex and neutral colours. Make sure wallpaper is clean and up to date. If walls are dirty, experiment to see if scrubbing them is easier than painting. Repair cracked plaster, loose door knobs, crooked light fixtures and faulty plumbing. 5. Make your house sparkle. If you do not have the time or the inclination, hire someone to thoroughly clean the house. Clean windows inside and out, curtains and drapes, and appliances. Have your bathroom scrubbed to pass a white glove inspection. If tubs or sinks are discoloured, have them re-glazed. Re-caulk the tub and shower if necessary. And above all, make sure you get rid of all your kitchen odors. 7. Tackle the basement. The basement is the catchall area where everything goes that has no place else to go, so it's usually a mess. Don't forget buyers are liable to be just as interested in the basement as they are in the rest of the house. Try and straighten it up and clean as much as you can. You might consider a coat of paint for the walls, or even the floor. 8. Tidy the garage. Empty as much as you can from the garage, hose down the floor, and paint the walls if necessary. If your garage is neat, it reflects on the way you take care of your home. 9. When buyers come to visit. Open all the curtains and blinds during the day and close them at night. Turn on the lights. If the rooms are dark, or your lighting is dim, replace the bulbs with higher wattage. The television should be off, but a little soft background music helps to set the tone. 10. Leave the house for the REALTORS® to show it. Professional REALTORS® showing properties have qualified their buyers and have an understanding of their specific needs. They will be able to discuss with their buyers the benefits of your home for their requirements. Remember your stiffest competition is the brand new "model" home your buyer has just seen . . . with no children and no animals! Listing choices include exclusive listing - which gives sole authority to offer your property for sale for a specified time - or a multiple listing via the Multiple Listing Service (MLS®) which provides access to a much broader base of potential buyers. MLS® can be a valuable sales tool when you are anxious to see your house quickly because your property gets greater exposure. Through MLS®, the details of your property are made available to a whole network of local real estate professionals who will seek to match your property with a potential buyer. Only a REALTOR® can offer you MLS® services. Brokers who are not members of your local real estate board, your provincial real estate association and the Canadian Real Estate Association cannot list on the MLS® system. After you have priced your home close to fair market value, and showcased it for sale, it is ready to take to market, ready for the real estate representatives who will be the first to see the house, and it is ready for the buyers they will bring. The task is to bring serious qualified buyers who are interested in a home with your specifications, and in your price range. Professional REALTORS® know how to separate "lookers" from "buyers". Your REALTOR® will "pre-qualify" potential buyers to save wear and tear on your home and lifestyle and to assure only serious offers are tendered. So now your house needs as much exposure to the market as it can get. And there are a series of steps an experienced REALTOR® will take to give your house the maximum exposure in the first few days and weeks that it can get. Your REALTOR® may or may not need the marketing activities above and probably will have additional activities. D. The Final Terms of the Agreement of Purchase and Sale..."the Offer"
Even when a buyer and a seller come close to agreeing on the final price of the property, the successful completion of the sale can rest on many factors which must be included in the agreement of purchase and sale. The bottom line is that anything is up for negotiation as the agreement is typically spelled out by the purchaser and agreed to by the seller. Sometimes the smaller items can hold up the outcome of a sale. The terms of the agreement are prioritized by each seller, and reprioritized by each buyer. They vary with each sale. • Conditional on Financing. If the buyer needs to find financing to finalize the agreement or the buyer is already approved for financing and the bank requires a satisfactory appraisal of the property, a condition of this sort is included in the agreement which must be met within a set period of time. • Conditional on the sale of the buyer's home. Sometimes the buyer, whose home is on the market, but not yet sold, wants to agree that the sale be subject to the sale of his property. In other words the Buyer agrees to buy your home as long as they can sell theirs within a set period of time. • Conditional upon home inspection by a qualified home inspector. The Buyer arranges and pays for an inspection of the home by a qualified inspector. • Conditional upon satisfactory home insurance In some instances older homes that have had few mechanical improvements have experienced huge rate increases. These increases have made some properties too expensive to own. • Closing dates. Some may want or need an earlier or later closing date than you would like. Be prepared for flexibility. • What equipment, fixtures and chattels of yours are included in the sale price? • Condition of the house, repairs the buyer may want or need to have done. • How the mortgages are dealt with (sometimes the buyer asks a seller to hold a mortgage). 1. In terms of all this affecting the final price of your home, it is enough to say that no two house sales are ever alike. Each seller and each buyer has a definite priority list. To some, the closing dates can have as much or more importance than the price offered. To others the condition of the house is significant. It is in the hands of those negotiating the transaction on your behalf to give and take in as many rounds as necessary to carve out of this process a solution agreeable to you and the buyer. Things are given and taken back until both parties have reached a signed and sealed "meeting of the minds". Only then are success achieved and the agreement on its way to completion. 2. Bring You the Facts. A REALTORS® most important task is to accurately determine the market value of your house. REALTORS® have access to the latest information on sale prices and trends in your area and will provide the knowledge, the date, and the recent trends, to help you make an accurate decision. 3. Help Showcase Your Home. REALTORS® should help you through all stages of the process outlined earlier to bring your home up to full marketable value. They will have the experience to be able to advise you on what renovations, if any, need to be made, and how you can best showcase your home for the maximum return. 4. Communication. One of the key parts of their relationship with you will be communication to you on all market activity, advertising, showings, inquiries, feedback from other REALTORS®, and any recent trends or comparable home sales that might have taken place in your area. Feedback will help keep your plans on track to ensure you have the full facts at our fingertips at any time new decisions have to be made. 5. Deal With the "Offer". The critical phase of the sale comes at the time of the offer presentation from the buyer. Your REALTOR® should have solid negotiating skills in dealing with all the intricate parts of the offer process.